Your oral health is the window to your overall health. It is more important than you might understand. 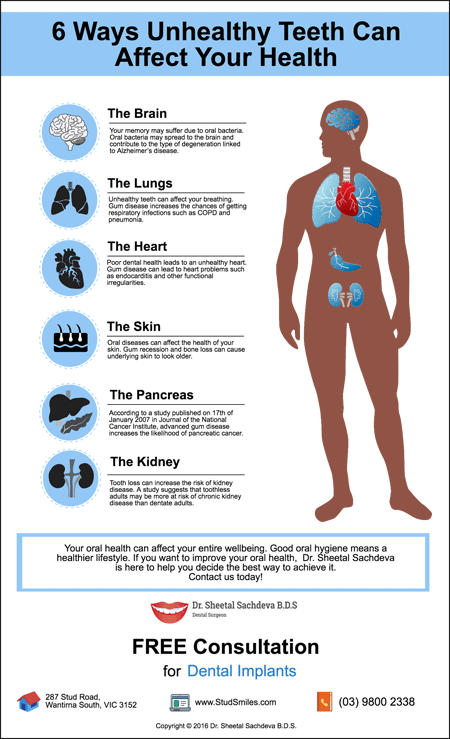 The health of your teeth and gums can affect your overall wellbeing. Other health conditions that might be connected to oral health include eating disorders, rheumatoid arthritis and Sjogren’s syndrome. Thus, it is important to tell your dentist if you have noticed any changes in your overall health or if you have a chronic disease such as diabetes. You can protect your health and your body by practicing good oral hygiene every day and by visiting your dentist regularly. Also, by maintaining a healthy lifestyle such as eating a healthy diet and avoiding tobacco use, you can maintain strong teeth and bright smile. As soon as a dental problem arises, see your dentist immediately. Dr. Sachdeva’s Dental Surgery, we offer a comprehensive range of dental treatments to prevent oral health issues while improving the quality of your life. We want you to experience the amazing benefits of healthy and beautiful smiles and how it can change your life forever.